Hearing Loops come in many forms. 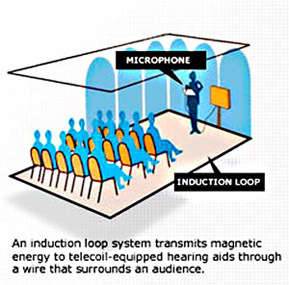 Basically, a hearing loop is some kind of loop of wire with an oscillating signal going through it. The difference from a speaker is that the signal comes from the wire itself rather than by air thrust from a speaker. Around this wire a magnetic field is rotating. It is sort of like a doughnut, but properly designed, there is no doughnut hole. If not properly designed, the center is too weak. This doughnut of magnetic energy carries the signal to the t-coil. 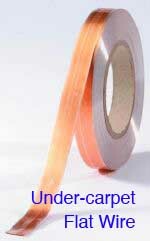 There are regular wires for most installations. The loop field has to be of a standard peak strength of 400ma/meter with less than six decibels variance across the loop field. The low frequencies cannot be more than six decibels louder than the high frequencies. There’s more to it than that, but it’s a start. There should be virtually no perceptible volume difference across the entire looped area. Check to see that your loop actually hits these standards. Sometimes people install loops and claim it meets standards when in fact it does not. Get the job done right the first time so your loop hits those marks. Call us (253.686.6684). Induction is how it all works. A magnetic field travels through the air and hits metal. The magnetic field energy turns back into electrical energy. When the metal is rebar, structural steel or a hung ceiling frame or even some plumbing, the electricity drains away robbing power from the loop. Some kind of array must be used instead. When the magnetic field hits a t-coil, it turns back into electricity that the hearing aid amplifier can turn back into sound. Hearing loops also work with cochlear implants and bone attached hearing appliances.